I can't lie — I absolutely LOVE Aussie football and have kicked a ball around since I was three years old. In fact, I always will. My ongoing love for the game is as certain as death, taxes and the fact that my beloved Melbourne Demons club will give me both incredible highs and heartbreaking lows each and every year. For most Aussies, a sporting life is very much the way of life. We are incredibly passionate about just about any game and spend countless hours either with the family on the couch or in a stadium passing on encouragement (and sometimes frustrated advice or constructive criticism) to our teams or favourite players. As I've gotten older, I've developed different passions and from a professional perspective, a particular love of disruptive technologies. Not just ideas that are disruptive for the sake of it — the ones that leave an impact for future generations, the ones that people wonder why no-one has ever thought of this before and embrace for decades thereafter. This week, the AFL launched a new website to encourage participation in Australian football – a grassroots-focused resource now hosted on its new .brand Top-Level Domain www.play.aflToday is one of those wonderful times when you get to blend your professional and personal passions. In 2009, I first met with the Australian Football League (or AFL), the most popular spectator sport in the country, about the possibility of acquiring the .afl Top-Level Domain. "Footy" is an Australian institution, with approximately 100,000 fans attending the AFL Grand Final each year and around 3 million viewers tuning in on television. To put this in perspective, Australia's population recently hit 24 million, so we're talking 12.5 percent of Aussies watching a single sporting match. Domestic participation in the game — including local and regional competitions and programs across the country — has been recorded at greater than one million. As one of the largest sporting organisations in the country, the AFL is a recognised and much-loved brand in the Australian market. Its programs to engage with the community, increase memberships and bring more people into the game are extensive and often innovative. This week, the AFL launched a new website to encourage participation in Australian football — a grassroots-focused resource now hosted on its new .brand Top-Level Domain — www.play.afl. Not only is this is the first website launched under .afl, it actually places the AFL as the first sporting code in the world to launch its .brand. Of equal importance, the launch of .afl places the organisation alongside globally recognised brands that also applied for their TLD, such as .google, .apple and .nike to name just a few. The .afl TLD provides an opportunity for the AFL to offer a more intuitive digital experience and visitors to any website that finishes in .afl can be assured that it is an official AFL website. As well as this, the AFL has adopted a really notable strategy for this launch that is a great example for other organisations looking to launch their TLDs. With the new .afl extension, the AFL has created a domain name that genuinely compliments its content. 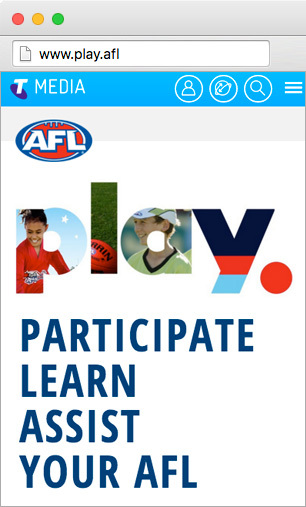 In this instance, "play afl" is the clear call to action, both encouraging the aim of the AFL's campaign and clearly identifying to the visitor what they can expect to engage with when they visit. It will be really exciting to see how that morphs into other areas of the AFL's business in the future. Similarly, the AFL's decision to launch its .brand alongside a campaign is a clever strategy for rolling out a TLD in an organisation with an enormous and complex digital strategy. Not only does the domain name speak to consumers, but it allows the AFL to roll out and promote .afl whilst retaining the afl.com.au domain as its continued primary source of information. Blending your personal and professional passions is a unique position for many to achieve but I feel incredibly excited about the opportunities ahead for the AFL with the .afl extension. More importantly, I guess I'm just a little bit proud to say that the sport that I grew up with and love is driving a global innovation in digital branding that I believe is the future for organisations across the world. Local Time: Tuesday, April 23, 2019 09:00 PM PDT – Page Load: 0.2711 Sec.